Just like us, putting on the pounds and carrying a lot of excess weight is also bad for our pets and can therefore result in obesity in cats and dogs. Again like us, it’s easily done and there’s often a mix of factors which can play a contributing part; Over eating, getting older, decreasing levels of exercise, mobility or medical problems can all have an effect. It’s often a gradual process so it’s not always immediately obvious. The way our pet looks becomes the “norm” and we often fail to notice that “healthy” is actually now looking unhealthy. Obviously some contributing factors are out of our hands, but we (their loving owners) can control a couple of key factors; the amount of exercise they get and what we food our pets eat. These factors play a very important part in keeping our pets well and preventing obesity in cats and dogs. Almost half of the overweight dogs seen in practice have health issues, musculoskeletal problems (99%), respiratory problems *49% or Diabetes (28%). 81% of cat owners like to give cats treats “to make them happy”. Vets and vet nurses estimate that 34% of cats they see each week are overweight or obese and of these, just over a third have weight related health issues; grooming/self care issues (77%) Diabetes (66%) and musculoskeletal problems (66%). Because we all love our pets, it’s important to realise that weight gain can and does sometimes creep up, we should understand the consequences for our pet and try to do our best by them. (most importantly) help your pet live a longer, happier, healthier life with you! 1) Obesity in cats and dogs – What are the health implications for my pet? decline in quality of life. I think we can all agree that these are conditions we should do our utmost to prevent with our beloved pet. The steps are simple, we just need to take a good look at our cat or dog to evaluate how they’re doing in respect of their weight and condition. As mentioned before, sometimes weight creeps up due to a number of factors. As a responsible pet owner, you need to regularly review your pet’s overall condition and take action accordingly. On a regular basis, feel around your pet’s middle when they’re standing up. It should be easy to feel their ribs and spine. You should also be able to feel a slight waist dip. If you can’t find a tucked in shape and their middle is more tubular shape, then your pet maybe overweight. Talk to your vet about a weight loss plan. If you need some help assessing your pet’s condition, there’s plenty of resource online from the main food manufacturers. Body condition charts show the differences between underweight animals, healthy body shapes through to overweight animals in a good, visual ways. Take a look at the charts from leading brand Royal Canin here. This video from Purina’s resident vet is also very helpful and demonstrates the checks you can carry out on your dog very well. You may have already realised that recently, your cat or dog was stopping sooner when playing or when on a walk, finding it hard to keep up and less likely to engage. Again this could be due to excess weight or weight related ailments. Again, get your pet checked out by your vet for advice. Reduce their calories: Once you’ve consulted your vet, they’re likely to recommend a lower calorie diet food to help get your pet’s weight down. Increase their daily exercise: Again, with veterinary advice, increase the amount of exercise time with your pet. Your vet will give you appropriate advice as to which activities are best, suited to your individual pet’s age, ability and breed. You may be thinking “Surely you can just simply start throwing a ball about and get your cat/dog to leap around a bit more? no need to visit the vet!” But what if your pet has undiagnosed joint or health condition? You may be doing more harm then good with that form of play. Just to be on the safe side, check with your vet first. Weigh out your pet’s food. Either as directed by your vet (if on a weight loss program) or appropriate to your pet’s current weight. DO NOT guess the amount of food you’re giving them. Just a small amount of additional food at mealtimes on a daily basis can quickly have a negative effect on your pet’s weight. Give treats with care. Giving pets a “treat” to make them happy or give them variety is a lovely thing to do, but we have to ensure we’re not “killing them with kindness”. Only give your pet treats designed for animals. Commercial treats do offer variety but give them sparingly, or use lower calorie/specific treats if giving a higher number, when training for example. Understand that treats are contributing to your pet’s daily calorific intake and will have an impact on their overall weight. Note: Avoid giving pets titbits or leftovers from your meal as treats – our food has a higher calorie level than food designed for our pets so weight will quickly pile on if we give pets scraps off our plates. 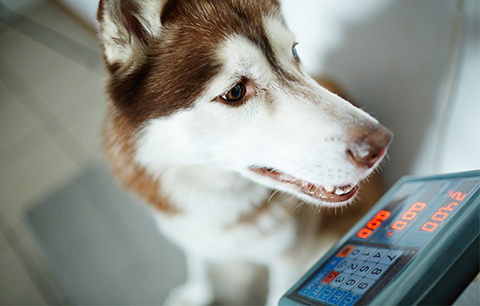 By weighing out daily amounts of food as recommended by the food manufacturer (these can differ so always check the pack if you swap recipes and/or brands) reducing or changing treats and encouraging the correct amount and type of exercise, we can help keep our pets in lean, optimum condition and prevent the problems obesity can cause. These steps combined with a regular or annual health/dental check up with your vets, should ensure your pet stays healthy and happy (and by our sides) for longer. As registered online pet pharmacy and part of the UK-wide CVS group, animal welfare is at the core of Animed Direct and we offer a wide range of products at lower prices, helping you to keep your pets healthy for less. We offer a huge range of high quality dog food and cat food from leading manufacturers in the market, including weight control foods for cats and weight control for dogs , dog treats and cat treats (with choice of occasional tasty treats, training treat, dental and low calorie treats). Below are just some of our popular brands of great quality diets. Royal Canin have a range of high quality food for neutered cats & dogs as part of their Vet Care range. Hills’ Science Plan Light is a great choice for those looking for diets for their cats and dogs that help keep them at a healthy weight. EUKANUBA have a wide range of dry dog foods, including Veterinary diets for weight loss. You can also find restricted calorie foods for dogs and cats as part of our Purina Pro Plan range. Always double check with your vet before starting your pet on a new diet, new diets can really help improve your pets life but you don’t want to pick the wrong one! If you have a prescription for medication to help with your pet’s condition, search for it on our site under Prescriptions A-Z. You should find essential medication more affordable than through your usual vet practice. We have a number of other blogs which are related to pet nutrition. Take a look to become better informed about looking after your cat or dog. If you ever have any concerns about your pet at any point, seek the advice of your local vet as soon as possible. I am just about to purchase Hills Metabolic Pet Food for my Beagle who is 7 Kgs overweight can you tell me what the recommendation is for daily feeding in arms?